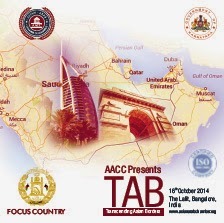 Transcending Asian Borders TAB 2014, International Conference going to be held on 16th October 2014 in Bangalore would highlight Trade and Business Opportunities in Asian and Arab region. Asian Arab Chamber of Commerce which has been providing a dynamic link for the promotion of Commercial and Economic relationships between Asia and the Arab world will host this year's TAB event. AACC has been helping the members in strategic marketing of the products and services in the target market. It has also played a significant role in business development by introducing to political and business leaders of the country in the last year. AACC also provides support to the companies by utilizing strategic alliances, technology exchange and joint ventures between Asian & Arab world. The last year's TAB 2013 Conference held in Bangalore was a wonderful blend of new ideas as well as informative discussions from well experienced personalities in Trade and Finance sectors. The SME focused conference was graced by 30 international speakers and attended by over 600 delegates from different parts of the world. AACC is focusing on strengthening economic, commercial and cultural relations between Asia and Arab region. To deepen this economic engagement, the governments of India and various Asian/Arab countries have established institutional mechanisms and entered into agreements aimed at providing added impetus to trade and investment flows between the two sides. AACC is the platform to facilitate all these engagements. This year sees an upgrade in talent during this TAB 2014 (Transcending Asian Borders). The delegations from China and Japan along with a new progressive government adapting a fruitful neighborhood policy at the Centre have provided lot of encouragement and support for this event. The conference this year focuses on bilateral trade and has added various fruitful business opportunities in Japan, Bahrain, South Korea, Bhutan, Brunei, Egypt, Afghanistan, Bangladesh, Oman, Maldives, China and the Arab League. TAB 2014 will see over 500 delegates, Ambassadors, Foreign Direct Investors, Young Entrepreneurs, Government officials, CEO's, Bureaucrats, Decision makers. With over 10 countries participating, delegates will witness a series of industry's best speakers inspire and instruct delegates on business opportunities in the respective countries.